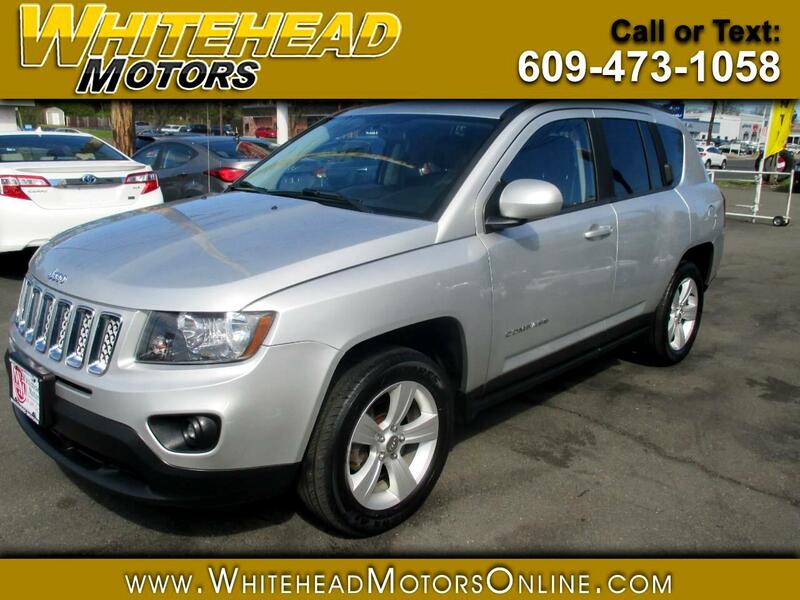 Our One Owner 2014 Jeep Compass Latitude 4X4 is presented in glistening Bright Silver Metallic Clear Coat. Powered by an efficient 2.4 Liter 4 Cylinder that offers 172hp while connected to a smooth-shifting 6 Speed Automatic transmission with Tip Start that helps you with easy passing maneuvers. This is an incredible Four Wheel Drive vehicle for a buyer that likes the look but prefers the smaller size of Compass and enjoys the near 28mpg on the highway. The exterior is enhanced by roof rails, a large sunroof, alloy wheels, a rear lip spoiler, trailer hitch receiver, and fog lamps. Amenities waiting to pamper you in our Latitude model include heated leather-trimmed front seats, heated mirrors, full power accessories, keyless entry, cruise control, air conditioning, 60/40-split-folding rear seats, a tilt leather-wrapped steering wheel with mounted controls, and the Uconnect system that features a touchscreen display, voice command, Bluetooth, USB/AUX inputs, and available Sirius radio to keep you connected and entertained. Standard safety features on this Jeep Compass include stability control with a rollover sensor, full-length side curtain airbags, and traction control. Anti-lock brakes are standard on every Compass for that sure-footed feel in about any road condition. Get your bearings, get a Compass. Print this page and call us Now... We Know You Will Enjoy Your Test Drive Towards Ownership! Get Approved In Minutes at Whitehead Motors. We Make Car Buying Easy.